Thistles, Stirling has announced the launch of Made in Stirling, an exciting new pop up store which aims to support local talent within the creative industries. Presented in collaboration with Creative Stirling, the not-for-profit community arts organisation working towards making the city a lively and culturally diverse place to live, work and visit, the pop-up store will run for three months and can be found within the centre near the Sainsbury’s entrance and opposite Debenhams. Underpinning the Made in Stirling ethos is a commitment to retailing quality, handmade products, created by a diverse group of independent artists and designers, across a price spectrum ranging from £5 to £500. One such talent whose products can be found within the store is Mia McGregor from Doune. 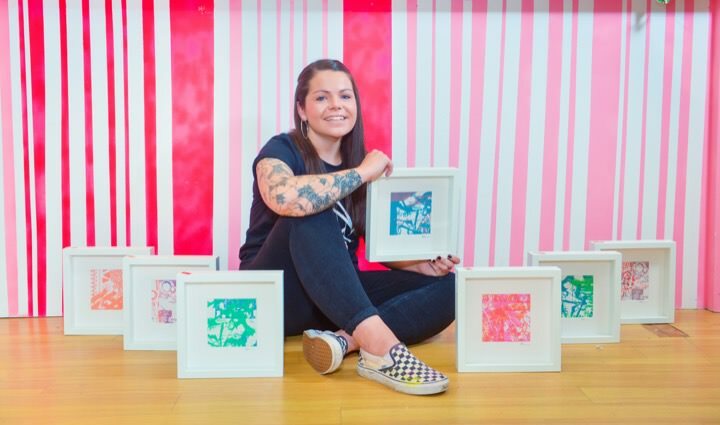 Having completed a BA in Art & Design at Forth Valley College before graduating with Honours at Stirling University, 30-year-old Mia has been instrumental in helping to establish Stirling as a creative hub. In addition to making politically and socially-conscious art for sale across wood carving, print making, spray painting, murals and graphic design posters, she is the creator of The Cube – an engaging Instagram platform encouraging creativity. Furthermore, Mia is behind Stirling’s first street art festival on the 22nd and 23rd of September called “Animating Our Streets”, which has links to the Stirling Photography Festival. Artist Mia McGregor inside The Made in Stirling store inside The Thistles.